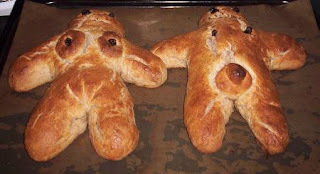 Mrs and Mr Babe :-) Yes, "anatomically correct" - as much as bun babes can be :-D If you find this offensive, I apologize. The challenge for this October was Tanta Wawa - bread babies. The Kitchen of the Month is Canela and Comino, a blog about the flavors of Peru, so naturally the bread recipe would also be Peruan. The Bread Baking Babes were mostly complaining about the dough being dry - mine wasn't. They also complained about it not rising, and I have to say that was also my problem. I didn't have the patience to bake the breads tomorrow, I allowed them to rise only for about an hour, and you see the results - both have stretch marks - the obvious sign of that the dough hasn't have time to rise enough. I made the bread according to the original recipe, except that I divided the amounts in 4 - I made only 2 breads. In a bowl, mix the flours, sugar, yeast, salt, cinnamon, cloves, and sesame seeds. Make a well in the center and add in the shortening, eggs, butter, milk, water and vanilla. Mix well then turn out and knead for 10-15 minutes. (Add extra water as necessary to moisten all the dry bits.) Cover and let the dough rest for 20 minutes. Divide dough in two. Form them into ovals the size of your hand. Cover and let the dough rest for 10 minutes. Preheat the oven to 180C, Brush the egg yolks over the dough babies. Bake at 180C for 30 minutes, till an instant read thermometer reads 190 deg. Also, I didn't have 170 grams of sugar. So I took all the sugar I had (about 70 grams), all the brown sugar I had (about 70 grams) and filled with molasses. I didn't have any sesame seeds, nor candy to decorate with. - you add the fresh yeast to the dry ingredients... I think if I'd try this again, I would do as my sensibility says, and add it to warmed up water-milk mixture. - the butter and shortening are to be added with the wet ingredients... but it isn't said anywhere whether they should be melted. I have learned that you ALWAYS put in the hard fat un-melted, it will aid in the rising. Also, I didn't have any shortening. I used all butter. So I crumbled the syrup and yeast into the flours, and kneaded in the butter last. The dough was dry at first, but I have been trying to learn to make hand-pulled noodles, and that dough is pretty dry/hard too, so I just kneaded and kneaded, and the dough worked out fine. Thanks so much for baking along with us! What fun! I am glad you enjoyed yourself and made yours unique. Your anatomically correct babies crack me up! Good job. Thanks for the vodka info you put on my blog. Good to know it's not all lighter fluid. Haha stretch marks are a sure sign of anatomically correctness! So cute! I love the anatomical detail! Thanks so much for baking with us this month. Yours look so delicious, I’ll have to give it a try. Thanks for sharing all of your great recipes.